the University’s rich history and traditions. The name “Saints” was used in reference to Saint Ignatius College athletic teams from the earliest days. Occasionally, the teams might be referred to as the “Blue and Gold” or, later, as the “Irish,” which indicated more of a Catholic than an ethnic association. The name Cleveland University and then its replacement, John Carroll University in September 1923, made continued use of “Saints” inappropriate. The 1924 season was barely underway when the sports editor of The Ignatian noted that other colleges had nicknames for their teams. John Carroll used “Fighting Irish” for a short time, but that was already University of Notre Dame’s nickname. Its early use was always in the singular; it became “Blue Streaks” in the 1930s. 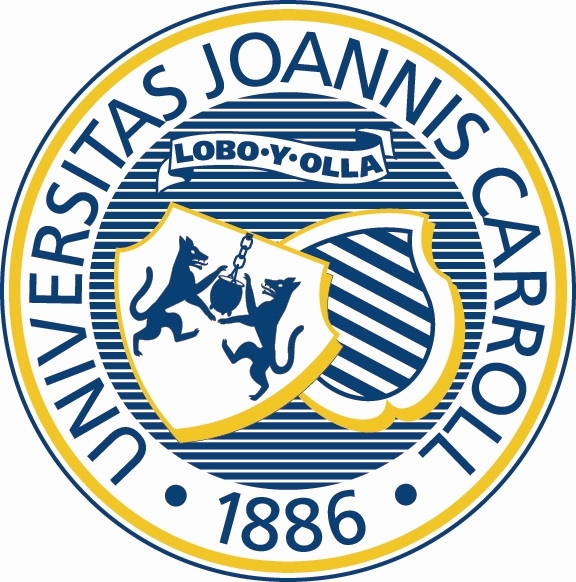 The John Carroll University seal is an adaptation of the coat of arms of the Loyola family, members of the Spanish nobility from whom the founder of the Society of Jesus descended. It contains symbols representing both paternal and maternal houses, Loyola and Onaz. The left shield portrays two gray wolves holding a kettle between them. A superior scroll carries the Spanish words Lobo-y-olla (“wolf and pot”), which became contracted to the name Loyola. A wolf was the usual symbol for nobility, and the whole design represented the generosity of the house. The tradition was that the Loyola family provided for its followers so handsomely that even the wolves found something in the kettle to feast on when the soldiers had finished. The right shield represents the maternal house of Onaz. The king granted the family the right to wear this as a mark of the bravery of seven heroic members who distinguished themselves in the famous battle of Boetibar in 1321.